Thus far, the Canadians I've actually spoken to have been quite happy with the health care system here in British Columbia. So I have to admit, when I was on the Aquabus from Granville Island and I overheard a woman of a certain age talking about having been ill lately, my ears perked up thinking I might have found my first dissatisfied customer. In the US, I generally find that the more someone has had to use their health insurance, the less satisfied they are. Sure enough, I engaged Aquabus Lady in a conversation and when I asked her if she'd had any problems with the health care system, she said emphatically, "Yeah. Plenty!" For the next couple of hours (in a conversation weird enough that I shan't begin to try to describe it) I tried to sort through a complicated set of complaints ranging from angiomyolipoma to high blood pressure and bipolar disorder. 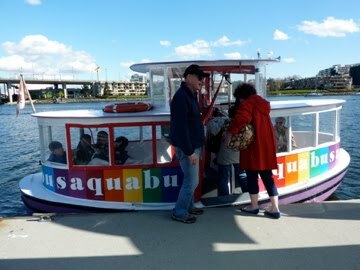 With respect to the misdiagnoses, Aquabus Lady was very unhappy about having been diagnosed with bipolar disorder, asserting she simply had situational depression. Hmmm. After spending, I kid you not, roughly two hours with her, Dr. Joan Pirkle Freud thinks she has some big problems. Bipolar disorder? Maybe, maybe not. The other misdiagnosis was mistaking angiomyolipoma for renal cancer. I have it on good authority (Wikipedia) that it can be difficult to distinguish between the two. In any event, when I asked her whether she thought this misdiagnosis was the result of poor quality care or an unwillingness to do proper testing, she said no. Her opinion was that she got topnotch care for her kidneys. With respect to complaint #2, it is true that acupuncture, chiropractic, naturopathy, and therapists other than psychiatrists are only covered for low-income patients with the government Medical Services Plan. In order to cover these services, as well as prescription drugs, many British Columbians have what they call extended health insurance coverage either through their employers or purchased privately. 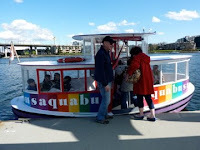 Aquabus Lady wished a mental health practitioner other than a psychiatrist would have been covered by the Medical Services Plan since she did not have extended health insurance coverage. She was displeased about being prescribed psychotropic medication by the psychiatrist. Quite understandable. As far as having difficulty getting one's own General Practitioner, many GPs in Vancouver are not accepting new patients at any given time. Apparently, lots of people go to clinics where they can see whatever GP is available at the time of their appointment. This sounds similar to going to an urgent care facility in the US. Aquabus Lady also complained that she needed to get a referral from a GP in order to see a specialist. This is similar to the requirements at HMOs and some PPOs in the US. It certainly can be inconvenient. According to other Canadians I have talked to, once a patient has received care from a specialist, no GP referral is necessary. So Aquabus Lady definitely has some legitimate complaints. Lack of coverage for holistic therapies, and the need for referrals to specialists are complaints we often hear in the US as well. Next time I'll tell you about the roundtable discussion on health care I had at the nail salon. I love this on location interview (convo) it brings healthcare into a real life scenario. I can definitely relate to the lack of insurance coverage for alternative health options. I definitely would want to see this change.